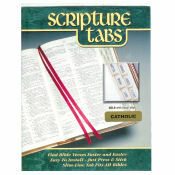 Pre-Printed Tabs for the Catholic Bible! Easy to Install - Just Press & Stick. These slim-line tabs are made to fit all Bibles.